Listen up Team BlackBerry! You may well have heard your iPhone and Android buddies banging on about how cool Instagram is. Us BlackBerry users don't yet get access to that app on our platform but there is quite a nice alternative I have found. MOLOME is similar to Instagram in that you can upload photos you have taken on your BlackBerry smartphone and then add one of 14 filters to change the way the picture looks. You can 'follow' friends who are also using the app so they will be able to see and comment on your photos and you theirs. In addition you can 'love' a friends photo by clicking the love button and they will be notified (hence the heart icons below with the key features). There is also get the option to share your upload via Facebook or Twitter which is a huge plus point. I suppose MOLOME is like a little photography social network in its own right. MOLOME is free to download and while it isn't as good as Instagram it is the next best thing for us BlackBerry fanatics. 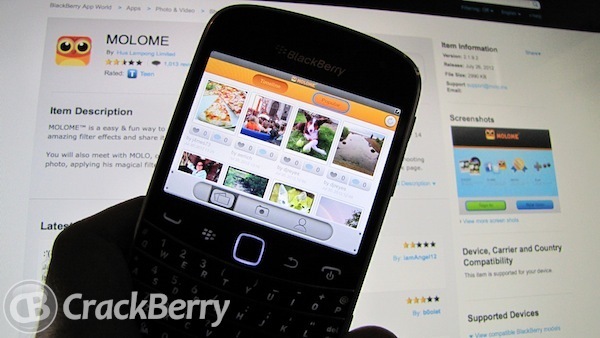 Fingers crossed we will get Instagram on BlackBerry 10 but if not MOLOME should be a lot better or a larger slab device.